The importance of knowing your odds in poker is unquestionable. We often find ourselves placed in a situation where our hand is not yet complete, but there is a good chance that it will improve its standing to be the nuts on the turn or the river. But what are the exact chances of this actually happening to you as a punter? A typical example for a situation like this would have to be when a player is waiting for the flush or the straight. Let’s just say we are dealt A 6 suited and the flop contains 2 7 J. At this moment of time we only have an Ace high, but unforeseen is the real value of our hand: we are holding the nut flush draw, but is it worth the money and the wait? It is inevitable for a serious player to be able to truly answer this question. If we are in the blind concerning our chances, we will not know with certainty whether it is worth calling the opponent’s bet. Did our opponent bet 10 in a pot of 30? Is it really worth becoming a sheep and following him? How can we really answer this question if we are unclear on our chances? In poker terms, the cards that will complement our hand to make it of greater value are called ’outs’. Now considering outs, how many do we have in the case mentioned above? In total, we can see the deck contains 13 diamond-suit cards, with two of these residing in our hands and two on the board, this leaves us with 13-(2+2)=9 diamonds. In this case it means that we have 9 outs and any of these will make our hand a nut flush. 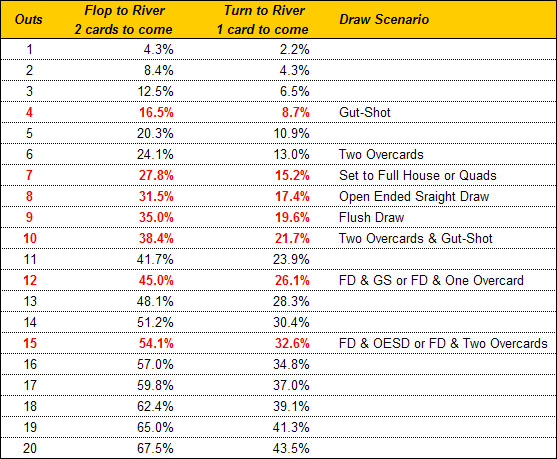 So, what are the odds of one of these cards turning up on the turn or the river?